After the Hawks on Saturday cut down to 53 players — including some surprising moves — here's an analysis of the opening-day roster. Now that the Seahawks have set their initial 53-man roster for the 2017 season it’s time to take a quick look at each position and how it came together over the weekend. KEEP: Russell Wilson, Austin Davis. 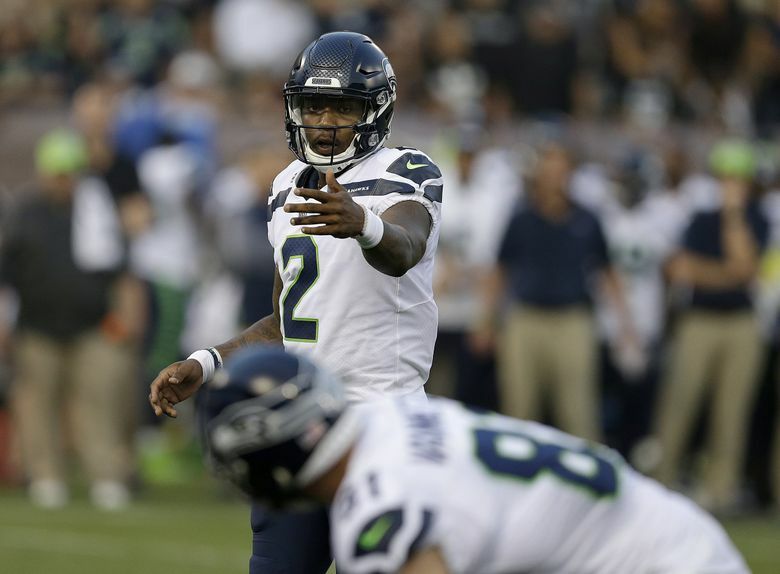 COMMENT: Ultimately the Seahawks went with the steady vet over erratic youth, deciding to keep Davis, who led a game-winning drive against the Raiders in a contest in which Boykin threw two interceptions, finishing the preseason with four — Davis didn’t have any. Davis will have to be paid about $300,000 more than Boykin, but the Seahawks obviously see some value in doing that, desiring someone who has played some after Wilson’s injury scares of last season. Boykin could be a practice squad candidate if he is not claimed on waivers. KEEP: Eddie Lacy, Thomas Rawls, C.J. Prosise, Chris Carson, J.D. McKissic. CUT: Alex Collins, Mike Davis. COMMENT: Ultimately no real surprises at this spot. Lacy, Rawls and Prosise seemed a given from the beginning and Carson was just about a lock from the first game. McKissic makes it as insurance at receiver and running back and maybe mostly as a returner with Tyler Lockett yet to play this preseason. Seahawks make the somewhat hard decision to walk away from Collins, a fifth-round pick last season. But he was simply beaten out at a spot where the Seahawks are deep. COMMENT: The Seahawks did indeed make the financially prudent move here to keep Madden, who is about $300,000 cheaper (Madden makes $465,000 to Reece’s $775,000) and won’t have to have his contract guaranteed to start the season as would Reece, who is a vested veteran. Seattle could bring back Reece later when his contract would not be guaranteed if it wants as the Seahawks did last year with Will Tukuafu. Still, it’s a big moment for Madden, who has been with Seattle off and on since May, 2016. KEEP: Jimmy Graham, Luke Willson, Nick Vannett. CUT: Tyrone Swoopes, Steve Donatell. COMMENT: The tight end spot turned out exactly as it looked all along. Swoopes seems an obvious practice squad candidate. KEEP: Doug Baldwin, Tyler Lockett, Paul Richardson, Amara Darboh, Tanner McEvoy. CUT: Kasen Williams, Kenny Lawler, David Moore, Cyril Grayson, Rodney Smith, Darreus Rogers. COMMENT: What might have been the biggest surprise of the day was the waiving of Williams — after the team initially reported he had been waived as injured it was clarified that he was simply waived. That means any team can now claim him. He could return to Seattle’s practice squad if he clears waivers. Williams had seemed just about a lock after finishing third in the NFL in receiving yards during the preseason with 208. But the Seahawks may also have noticed that he caught just one pass for four yards in game three against the Chiefs when the starters played into the second half and also may have preferred the special teams prowess of McEvoy. Darboh only caught three passes in the preseason, all against the Raiders Thursday. But his status as a third-round pick made it always pretty much a given he’d be on the roster. McEvoy also remains an intriguing talent with unique size, standing 6-6. KEEP: Justin Britt, Mark Glowinski, Oday Aboushi, Ethan Pocic, Luke Joeckel, Rees Odhiambo, Germain Ifedi, Matt Tobin, Jordan Roos, Isaiah Battle. CUT: Joey Hunt, Will Pericak, Darrell Brown, Tyrus Thompson. COMMENT: After making a trade with the Chiefs to acquire Battle the Seahawks now have 10 offensive linemen on the roster. That could obviously change, but that would be the most the team has had in a few years — Seattle also technically had 10 OLs on the roster to start the 2013 season though one was Mike Person, who was sort of an extra tight end type. Roos makes the team as an undrafted rookie free agent and appears to be this year’s rookie the team is enamored with for the future if not necessarily for the present. The other eight had seemed a given for a while. Hunt, the backup center last year, lost that spot to Pocic due in part to the fact Pocic can back up everywhere while Hunt plays only center. KEEP: Michael Bennett, Cliff Avril, Jarran Reed, Sheldon Richardson, Frank Clark, Nazair Jones, David Bass, Marcus Smith. CUT: Athyba Rubin, Quinton Jefferson, Garrison Smith, Jeremy Liggins, Tylor Harris, Christian French, Greg Milhouse, Rodney Coe. NFI: Malik McDowell, Dion Jordan. COMMENT: The big move here was the release of Rubin, a starter the last two years. But the addition of Richardson appeared to make him the odd man out in the starting lineup as did the emergence of Jones. Still, it won’t be a surprise if the Seahawks keep looking around for interior defensive linemen. Bass and Smith each made it with strong preseason showings and add to the pass rush. Their emergence allowed the Seahawks to trade Marsh, a fourth-round choice in 2014 who had three sacks in three seasons, to New England for a 2018 fifth- and seventh-round draft picks. Coe and French were waived as injured and could revert to Seattle’s Injured Reserve. KEEP: Bobby Wagner, K.J. Wright, Michael Wilhoite, Terence Garvin, D.J. Alexander, Dewey McDonald. CUT: Mike Morgan, Kache Palacio, Otha Peters, Rodney Butler. COMMENT: This spot also turned out pretty much as envisioned all along — and recall that Smith can also play some strongside linebacker, as could even Bass in a pinch. McDonald and Alexander will each be core special teams players and Wilhoite can also back up in the middle.The Seahawks think this is a better overall group than last season with the additions of Garvin and Wilhoite and Alexander. KEEP: Richard Sherman, Jeremy Lane, Shaquill Griffin, Justin Coleman, Neiko Thorpe. CUT: Mike Tyson, Pierre Desir, Demetrius McCray (waived as injured). COMMENT: The one mild surprise Saturday was the waiving of Desir, who had had a strong camp leaving some thought he could beat out Thorpe for the final spot. But Thorpe has a two-year contract and would have counted $300,000 in dead money against the salary cap if waived. Thorpe also has been one of the team’s best special teamers. Coleman was acquired Friday and appears set to be the backup nickel. KEEP: Earl Thomas, Kam Chancellor, Bradley McDougald, Delano Hill, Tedric Thomson. COMMENT: No real surprises here. There had been some thought that Thompson might not make it after a preseason in which he didn’t stand out all that much. But the Seahawks are also surely reluctant to give up yet on a player taken 111th overall last April. KEEP: Blair Walsh, Jon Ryan, Tyler Ott. COMMENT: Nothing ever changed here or needed to as all appeared to have strong preseasons.